Product prices and availability are accurate as of 2019-04-25 14:01:10 UTC and are subject to change. Any price and availability information displayed on http://www.amazon.com/ at the time of purchase will apply to the purchase of this product. Unleash the mighty power of Lord Vader's lightsaber to cut your pizza! Modelled after Darth Vader's iconic weapon, this fun and functional kitchen utensil is a must have for any Star Wars fan or collector! 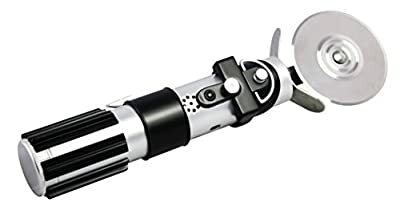 The Star Wars Darth Vader Lightsaber Pizza Cutter is made of plastic with a stainless steel blade and features Original Darth Vader lightsaber sounds which are activated as the pizza is cut! Requires 3x "LR41" 1.5V button cell batteries (included).